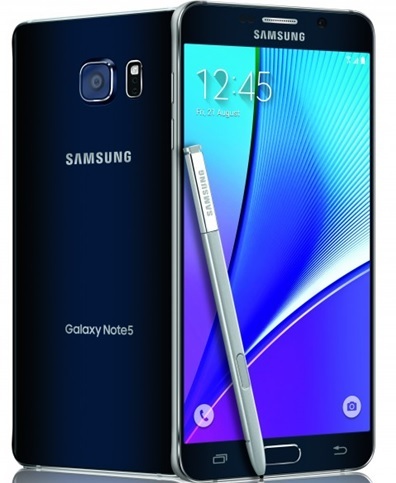 South Korea – The Korean electronic tech giant, Samsung (NASDAQ: SSNLF) has unveiled Galaxy Note 5 at the Galaxy Unpacked 2015 event in New York. The smartphone will be available in select markets from August 21 with wider availability from September. However, Galaxy Note 5 will not be available now in the European market. The world’s leading smartphone shipment company seems to think that people in Europe are less in love with the S Pen stylus. Also, those people are less attracted towards the software features which differentiate Galaxy Note 5 from Galaxy S6 Edge+. Thus, Samsung took the decision to focus only on the US and Asian markets and not to introduce Galaxy Note 5 in the European market now. The metal and glass bodied Note 5 sports giant 5.7-inch Super AMOLED screen with QHD resolution. The phablet is less than 0.3 inches thin, weighing around 171 grams. And it is designed in order to make multitasking easier. Running on Android 5.1.1 Lollipop OS, Note 5 is powered by an Octa-core Exynos 7420 processor with 4GB RAM. When it comes to internal memory, the smartphone is available in two variants viz 32GB and 64GB. There is no microSD card slot for the expansion of storage. Galaxy Note 5 houses 16MP rear camera with auto real-time HDR and optical image stabilization feature. Also, video shot on the Note 5 can be viewed on a 4K TV. It also has a 5MP front snapper. There is also new full HD Live Broadcast feature added by Samsung allowing streaming of video to YouTube. Some of the other features include Ultra High Quality Audio providing richer sound, Samsung Pay, updated fingerprint sensor and S Pen stylus. The S Pen stylus allows user to write things down even when the screen is off. However, the smartphone is backed by a lower capacity 3,000 mAh battery compared to 3,220 mAh battery of Note 4. However, Samsung has provided improved fast charging wireless and wired options. The smartphone comes in four color variants; Black Sapphire, White Pearl, Gold Platinum and Silver Titanium. It will available from August 21 in the US by various carriers priced accordingly for lease, contract, off-contract and installment schemes.